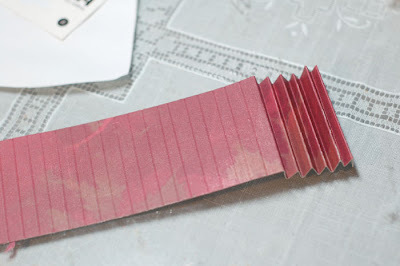 After I posted my Papertrey Tussy Mussy project, I got several requests to do a tutorial. So I put this one together. Hope you find it helpful. First, you need to create a cone in the size you'd like. This might take some playing around. I have several templates that I've used. To make one, use a compass and draw an arc. 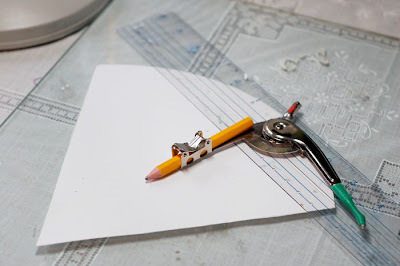 Then use a ruler to draw the sides. Cut it out. 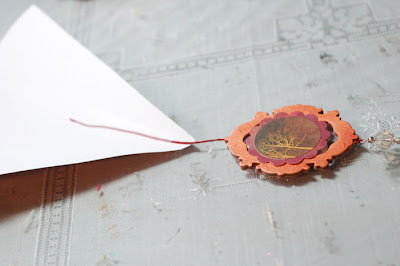 Trace the template onto patterned paper and cut out. 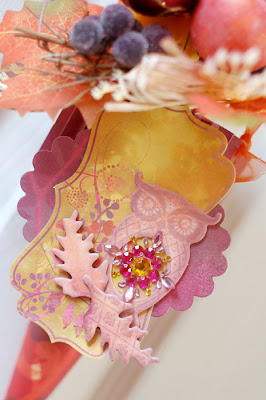 I used some Basic Grey Indian Summer papers for this project. 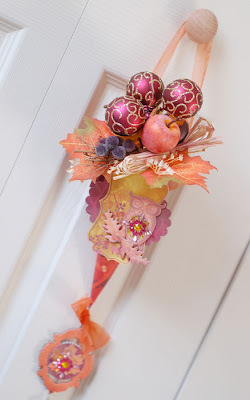 Next, create something you'd like to have hanging from the bottom. I used two Regal Font frames sprayed with Harvest Orange. 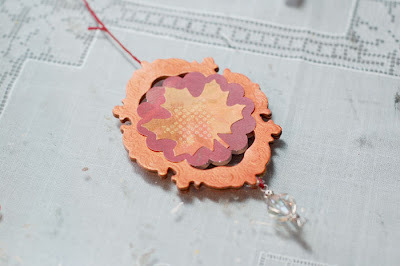 I cut two circles using the Spellbinders scalloped circle dies. I added stickers to them and adhered them over the frames using foam tape. I added a bead on some embroidery floss and left a length of floss from the top of the frames. Tape this to the inside of the paper cone. Now comes the tricky part. Roll the cone up, starting at the bottom. Adhere using hot glue. I've found it's the best adhesive for holding it together. Start at the bottom and add a bit of glue at a time. It cools too quickly to do the whole thing at once. Now that you have your cone done, it's time to embellish. To make the 'collar', I cut a 12 inch strip of paper, score it every 1/4 inch and then fan fold it. This is adhered with hot, glue, too. 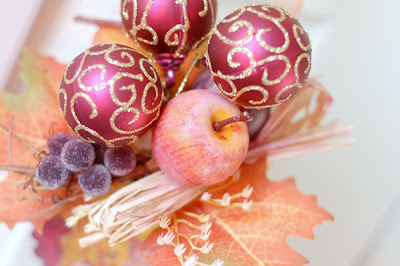 For this project, I used a fall and christmas pick from the craft store. To make the colors coordinate better, I spritzed the picks with Black Cherry and Irridescent Gold Glimmer Mists. This gives it such a pretty glimmer! I also created a framed tag decoration. 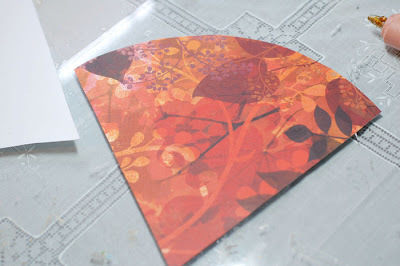 I cut a large scalloped oval with my Spellbinders die and Wizard. I added a sticker label and some Nature Chips that have been spritzed with Harvest Orange and Iridescent gold. This was adhered using a glue gun, too. Finally, punch holes in the top and attach some ribbon. Place the picks inside and you're done! Wow! What an amazing project Anabelle! Love it! This is beautiful, Anabelle. I will have to try it. Wow, this is SO gorgeous! Thanks for the great tutorial too! Gorgeous project, and great tutorial. perfectly gorgeous!! thanks for the great tutorial!! What a beautiful project Annabelle - I've always loved Tussie Mussie posies and used to make them with bits and pieces from the herb garden many years ago. Thank you for a lovely tutorial. Just wanted you to know that I loved this project so much I've already made a tussy mussy of my own. 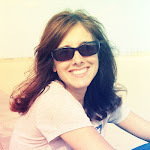 I've posted it on my blog w/a link to your tutorial, of course. Thank you so very much! Keep the inspiration coming!